Paul Ryan, who used to regularly signal his displeasure with Donald Trump, has backed Trump to the hilt since the election. And so the newest meme has been born: Paul Ryan has no spine. Andy Borowitz and ClickHole have columns riffing on the Spineless Paul Ryan meme, and somebody even edited the Wikipedia invertebrate page to add the House Speaker. It is true that Ryan does not care about the principles he claims to care about. But it’s inaccurate to imagine him as merely a soulless careerist. Ryan does have serious principles. He is deeply committed to the principle of liberating the affluent from the burdens of progressive taxation. That description may sound like an arch comment to those of us who don’t share Ryan’s bent. But to people like Ryan, it is a moral conviction of the highest order. Ryan has repeatedly cited the influence in his younger days of such works as Wealth and Poverty, by George Gilder; The Way the World Works, by Jude Wanniski, plus, of course, Atlas Shrugged, by Ayn Rand. These books treat the struggle against progressive taxation as the fundamental project of politics. The central problem of mass-participatory politics, in this view, is its tendency to allow the masses of voters to gang up on the rich (whether through democratic or undemocratic means) and redistribute their deserved rewards to themselves. It is tempting to dismiss his fixation with the top tax rate as greed on behalf of his donors, but to adherents of this ideology there is nothing more serious. Obviously, the defense of the right of the one percent to keep its earnings is an unpopular basis for political messaging. And so Ryan has an ecumenical view of the political message needed to sell his policies. He is happy to posture as a fanatical debt hawk if debt-hawkery is a promising vehicle to advance the goal of cutting taxes for the rich, but he will also support and even demand massively higher deficits if that is what is needed. Ryan has promoted outreach to Latinos and other socially moderate constituencies as a practical step toward expanding his party’s base. 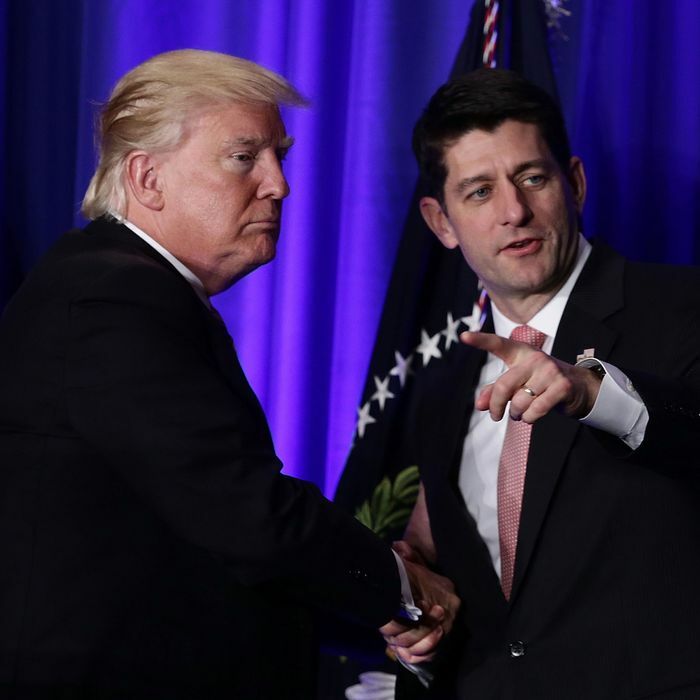 Ryan continued to defend those policies before the election, when it looked probable that Trump would lose, and he would need to rebuild in the wake of the expected defeat. But he is also perfectly willing to abandon those policies if he happens to have a race-baiting Republican prepared to sign his cherished tax cuts into law. Ryan might supplicate himself to limitless acts of corruption or misrule by Trump, but he would never stand silent if Trump attempted to implement even a tiny tax increase on the highest-earning one percent. I happen to find Ryan’s belief system to be rather deranged. But it is a belief system.